"Oh, a package!" I thought excitedly, as I strolled up our front porch steps after work. "Maybe it's my August Birchbox!" BOOK OF THE MONTH CLUB!!! Last month, I read Missing, Presumed, which was a mystery book that took place in England. In addition to my hardback novel, BOTMC also included a tote bag, sunglasses, and crazy straw because they're just that neat. 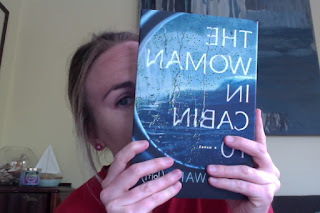 My August book is called The Woman in Cabin 10, and it's written by Ruth Ware. I actually saw this novel quite a bit in the various airport bookshops during my recent trip to Austin. The cover art alone has me intrigued! Liberty Hardy described the novel as a "delightfully fun mystery," so my hopes are high for this one. And guess what? THEY EVEN SENT A WINE KOOZIE! I mean, how cute is that? Cute enough to demand I wrap up my querying and editing for the evening to curl up with some red wine and a book instead? Yes, I believe it is that cute. What a cool idea for a monthly subscription! I'll have to check that out! I'm always looking for new stuff to read! Ahh I have been wanting to join the book of the month club, but haven't pulled the trigger! Looks so fun. I am soooo into reading again lately. Super cute idea...wine and books. Yes.